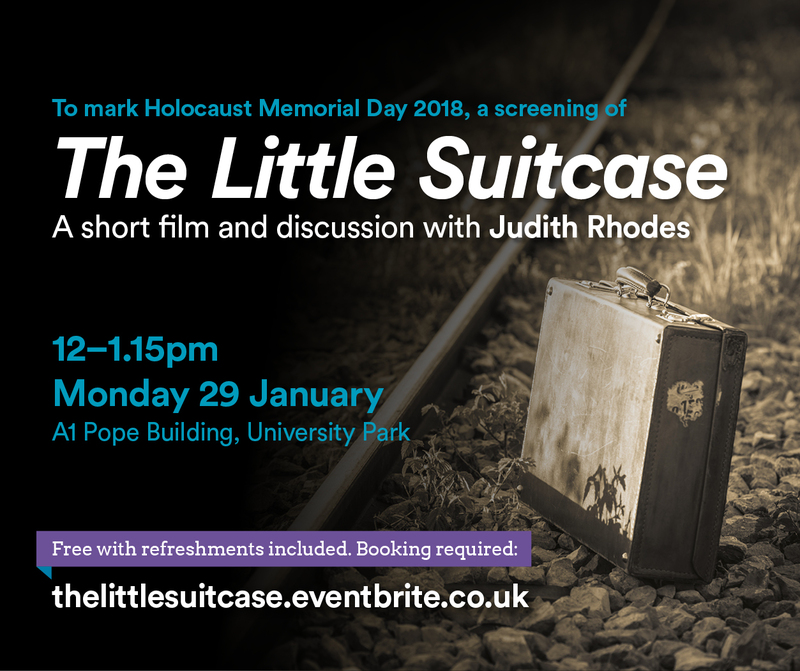 To mark Holocaust Memorial Day 2018, the University of Nottingham is delighted to invite you to a screening of ‘The Little Suitcase’, followed by a discussion with the story-teller, Judith Rhodes. This 20 minute documentary film tells the story of Ursula Michel, Judith’s mother, who came over to the UK on Kindertransport during the Holocaust. Ursula was one of the last children to escape Nazi Germany to England in 1938, just after the persecution of Jewish people began. She was sent to Stoke-On-Trent with only a tiny suitcase of belongings, without her parents and little sister at 14 years old. Judith will also bring along some of her mother’s processions that she kept from this time. The screening will take place on Monday 29th January (12:00-13:15) in A1, Pope Building, University Park. Refreshments will be available. Please feel welcome to bring your lunch.